We all know (or at least suspect) how much cover art affects our decision to pick up a book, much less buy it. I am not immune. In fact, I’ve discovered that I am quite the cover snob. That is the reason I didn’t pick up Bec McMaster’s steampunk romance Kiss of Steel right away – its cover art. Never say that I don’t learn from my mistakes, because after seeing Jane of Dear Author’s positive review, I picked it up anyway. Kiss of Steel and its companion novel, Heart of Iron, are unexpectedly entertaining (and steamy!) historical fantasy romances, and well worth the read. Beware/bonus: ess-eee-exx. Oh, and if you're looking for more steampunk with strong heroines, check out my Girls in Steampunk Week! In Kiss of Steel, Honoria Todd is desperately trying to hold her family together after the disappearance (and presumed death) of her father. She has relocated her younger sister and brother with her to the slums, and is eking out a living as a teacher. Unfortunately, her efforts don’t do enough to keep the cold at bay or buy enough medicine for her brother, and she must put herself at the mercy of the blue blood (a human infected with a blood craving virus but not yet a mindless, dangerous vampire) who goes by the ominous moniker of the Devil of Whitechapel. How this dangerous character and Honoria deal with each other (and eventually fall in love) takes up the majority of the story. Kiss of Steel’s strengths were descriptions of class structure within the alternate London, how Honoria dealt with her relationships while looking for a cure for the virus at the same time, Blade’s noblesse oblige and its effect upon a forgotten neighborhood, and (of course) the sexual tension between Honoria and Blade. I very much appreciated how a little information was given out bit by bit, but not dumped, on the reader. In addition, McMaster did a good job of playing with different characters’ motivations and revealing them slowly over the course of the story. On the negative side of things, the cant dialogue was more distracting than helpful, and there were a few quibbles I had with the world-building (things that weren’t explained or didn’t make sense within the set-up, such as how Blade or most of the Echelon actually made money). 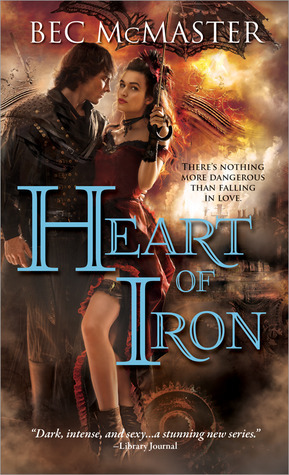 In all, though, I thought it was a strong romance, and I was anticipating the next in the series, Heart of Iron. Heart of Iron follows Honoria’s younger sister Lena and Blade’s second-in-command, Will Carver, who is a verwulfen (werewolf). Lena made the decision to return to the world of the Echelon in hopes of contracting as a thrall (someone who willingly exchanges blood for creature comforts), but she is now acting as a spy for an organization that plans to overthrow the Echelon’s social order. While she walks this dangerous line, Will is thrust into the spotlight as one of the only verwulfen in England as a contingent from Scandinavia visits in order to form an alliance. Lena and Will must work together, but old attraction won’t leave them alone for long. In the first in this series, Blade was the one pushing for a relationship, rather than Honoria. In Heart of Iron, Lena is the one in charge (regardless of how the summary makes it sound!). This dynamic is a refreshing switch, and there’s more of a slow burn than the ‘will they, won’t they’ vibe from the first book. At the heart of it all is Will’s werewolf virus, his superhuman control (or lack thereof), and a strong thread of nostalgia and longing for the world you knew, rather than the world you have now. McMaster also weaves in loss of innocence along with further world-building and the dynamics within the foreign delegation. Heart of Iron is a strong follow-up in an interesting world, but some of the same small annoyances followed from the first book to the second (historical slang, unexplained $$). In addition, there were almost too many characters, viewpoints and motivations to decipher for a romance-centric plot. It is to be hoped that McMaster ties off some ends in her next volume, while at the same time maintaining the compelling romance factor. Both books recommended for: fans of Gail Carriger’s Soulless and those who like steampunk or historical fantasy mixed with romance. I'm not sure about these. I do like steampunk and romance, but I can find too many characters distracting. I have a really naive question to ask. What exactly is steam punk? Briana: Thanks for asking! Steampunk is a reimagining of the the Victorian era, with advanced science and technology. Think Jules Verne/League of Extraordinary Gentlemen. Gail Carriger gives a great (and in-depth) definition here: http://www.gailcarriger.com/steampunk.php. Hope that helps! Thanks for the reviews. I'm not sure I'd enjoy these, based on your comments about dialogue. I'm such a big dialogue person. haha I'm glad the information isn't dumped on the reader though- at any rate, I need to find a good steampunk. I don't think I've read a book in the genre yet, but some have looked pretty darn good. At first glance, I would not have thought this was a steampunk book. I'll save this one for the romance pile.